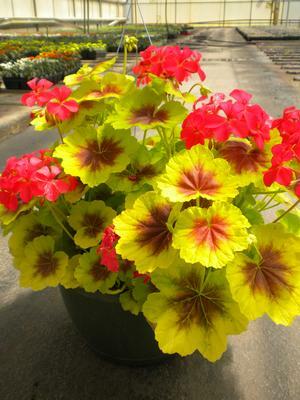 Vancouver Centennial has warm colored foliage of green and bronze and produces deep coral blooms. The Geranium Brocade is a specialty geranium treasured for its unique foliage and excellent weather tolerance. This is a great annual for Spring, Summer, and Fall. Geranium Brocades produce large bundles of pretty blooms that extend above the striking foliage. With the Brocade’s clumping habit and variegated foliage, this regal plant is attractive in any bed, container, landscape and baskets.